Since it is the month of Ramadan we elongated the number of pages so that people can read when free. For example Muslims now have more free time than the other months. The time they used for breakfast and lunch are now free time. Every other Islamic group this month (Ramadan) is working extra to give out more Islamic materials. We as Muslims are told to compete in good things so we want to adhere to this and ensure we are not left behind. In the Shade of the Quran; Sayyid Qutb, Volume 10, Surahs 12-15, Pg 35: Anyone who looks for signs, indications and clues will find plenty in the story of Yusuf and his brothers. This opening is sufficient to alert our attention and interest. Hence, it is similar to the raising of the curtains to allow events to take place. In the Shade of the Quran; Sayyid Qutb, Volume 10, Surahs 12-15, Pg 120: Yusuf’s story is but an example of the histories of God’s messengers. It provides lessons for those who wish to reflect. It confirms what earlier scriptures emphasized, even though Muĥammad (SAW) had no access to these scriptures. What he preached could not have been a fabricated tale. Lies do not confirm one another. They neither provide guidance nor spread an air of mercy over believers’ hearts. We are obviously not going to cover all of these 1,000 lessons or more but we wish to present the few lessons and benefits we have found from different people and scholars. We are going to assume that you know the story of Yusuf and hence we will present lessons without following the order of the story in most cases. Grammar: By using the ‘living’ (masculine ‘aaqil [intellect]) plural Saajideen, instead of Saajidaat (female plural used for Objects). By Prophet Yusuf saying ‘Saajideen’ he is saying that he knows it is humans (not objects) who will prostrate to him. Lesson: It is best for any Muslim to try his or her level best to learn the Arabic language to the best of his or her abilities. Don’t you want to understand the Quran? Some scholars say that had Yusuf (a.s) asked Allah (swt) to only remove him from them, that he would not have been imprisoned. But he said prison is more beloved to me and Allah responded to his du’a. Lesson: We must be careful in how we phrase our du’a to Allah (swt) because Allah is always listening. The way we phrase our du’a has an impact. Allah (swt) did save him from their plot but it did not happen immediately. Lesson: Crying is not a sign of innocence. Crying is not a sign of truth. You could cry while you are lying. Crying is the extreme part but this applies to other lesser forms of trying to make portray an image of innocence. So over here the brother of Yusuf came back lying but they were the ones who committed the crime. A desire that you have not yet fulfilled. The Minister’s wife had a desire and she fulfilled it. Mufti Mohamed shafi describes the want of Yusuf (a.s) as a desire that any man would have when he sees an attractive woman but he controls himself. The crime is acting on one’s desires not the desire itself. Anwar Anawlaki: Since Yusuf was adopted as a son, it is predicted that Yusuf was around 25 years old and the Minister’s wife was around 40 years old. We cannot believe that she resorted to such extreme measures seen in (Qur’an 12:33) suddenly in that moment. No! A woman will not resort to using force except if she has exhausted all other means. She must have tried everything possible before she started using force. And imagine this because Yusuf was living with her. So for Yusuf, it wasn’t a spur of the moment. Yusuf was going through this pain and trial for a long time. He has been presented to this seduction for a very long period because she will not act this way of shutting the doors and trying to force him except if she has tried all other means before and they didn’t work. So she must have been doing this for months or even years. It’s difficult enough to stop it as a spur of the moment but the difficulty increase when this has been going on for months/years of seeing her day and night, they are feeding you and there is interaction. This husband was supporting his wife by letting the issue slide easily. It seems he cared more for his reputation than justice. This is later on evidenced when Yusuf was sent to jail for committing no crime. This was done to limit the effect of the scandals. Now the Minister’s wife has been rejected and she called her friends just to show off Yusuf to them since they were talking badly (though it was the truth) about her. We see the statement she makes in (Qur’an 12:32) totally considers only the fulfillment of her desires using the wealth and power granted by her husband over Yusuf. She would go so far for her desires to even put an innocent person in prison in order to disgrace him just because she felt humiliated for being turned down. Women who have no power will have no other options but to hate the person who rejected them or to be cold towards them or to continue pursuing them by any other means. The situation is now for the worse for Yusuf as can be seen in (Qur’an 12:33). Yusuf says that it was their plot that he wished to be turned away from, not just the minister’s wife. Lahum – why is the masculine used when we are talking about women (huna)? Lahum refers to the political leaders. All these women are the wives of these politicians. Their wives have all cut their hands and after finding out what happened they meet together because their careers are now at stake as a result of the stupidity of their women. They need to figure out a way to suppress the scandal. They thought of the implications that this might have on their careers and decided that the only way they could suppress the scandal was to imprison Yusuf (a.s) without trial until a given time. They would soon forget about Yusuf (a.s) because he has no political significance for which there is a need to remember him. IARLG Lesson: Immoral people will do anything to fulfill their desires and such immorality will be supported by the wicked that are present. Yusuf was being bothered by just one woman at the beginning, and then later on her husband didn’t assist Yusuf. Then the women didn’t assist Yusuf. Then the leaders didn’t assist Yusuf. When all these people didn’t assist Yusuf, they were in fact assisting the Minister’s wife and hence supporting immorality. Doing wrong is human and having to repent to Allah is necessary but they didn’t repent. Yusuf was in the end helped by Allah via the righteous good act of the Prisoner who remembered him later and the King who rectified the situation by Allah’s leave. (Qur’an 12:18) – The shirt proved to his father that his brothers were lying. (Qur’an 12:25-28) – In defense to his honor and innocence, the shirt proved that the Minister’s wife was lying. (Qur’an 12:93-96) – It concludes with the shirt acting as a miracle for it allowed Yusuf’s father to be cured of blindness. Shirts were a proof throughout Yusuf’s life. Do you realize that you also have many things that assist you like the Yusuf’s shirts assisted him. You might say, but I don’t have any miracles like curing the blind seen in (Qur’n 12:93-96). We have the Quran, the greatest miracle for curing the hearts of people who wish to be guided. Isn’t that greater? Lesson: When you are hit with misery/problem in this life, which this life is full of them, all you’ve got is patience. Be patient and your patience is for Allah. There is no end to patience. Patience is the resort when there is no other resort. What could Yusuf’s father do? Kill himself or kill his sons? Slap his face and tear his cloth? He needed Patience. You need an attitude of patience, for example: Allah took away my leg, praise be to Him that He left me with one leg;; Allah took away my child, praise be to Him that He left me with three children. A Bedouin said, “I had camels in the desert and I went to fetch them, I left my family behind and when I came back I found that they were all dead because of being preyed on except my little baby. So I ran to my little baby and I took him then suddenly my camel ran away. So I put my baby down and ran after the camel. By the time I got to the camel, it kicked me on my forehead and I lost most of my eyesight. By the time I got back to my son, he was preyed upon. I had one of the richest merchants of my time and within a matter of moments all that was gone. So when the caravan came back it took me alone and as you see how I am partially crippled. Then all I could say is praise and thanks be to Allah for what He has left for me and I look forward to the life after.” That’s how life is. This is how the people before took things, that is why one who depends on Allah doesn’t have depression, high blood pressure, cholesterol….unless it is inherited/decreed. But to have it because you are always smoking cigarettes after cigarettes when you have a problem. We don’t have that. We depend and seek patience with Allah. Lesson: Turn to Allah when hit by misery and if there is an injustice against you that you can do nothing about you can complain to Allah as Ya’qub did in (Qur’an 12:86). You can complain about your grief and sorrow to Allah. Lesson: Excellent advice from a Prophet of Allah. He tells us to never give up hope of Allah’s Mercy since doing so will make us disbelievers. The angels in (Qur’an 15:55) are telling us not to despair; they were not telling only Prophet Ibrahim. Allah recorded their speech and they were also telling the Ummah of Prophet Muhammad (SAW) via the Quran. Prophet Ibrahim adds on by informing us that those who despair of Allah’s Mercy are those who are astray. You should be aware that in case you despair of Allah’s Mercy, you will hate Allah and that is very bad. Once you hate Allah, you will inevitably hate what He sends down. Then your deeds will be worthless. If you hate any Ayat in the Quran, you risk falling in this category. Allah is not joking since He repeated Himself many times, for example He repeated Himself by saying in (Qur’an 47:8) that He will make their deeds vain and in (Qur’an 47:9) that He will make their deeds fruitless. Who are they who deeds will be vain? The ones who hate what Allah has sent down. He could not take his brother according to the religion of the king. Allah used the word deen (religion) for the law of the king. Laws are part of religion. In this secular world, it is being engraved in our minds that laws (eg. criminal laws) has nothing to do with religion. Allah in the Quran is calling the law of the king, deen (religion). Allah didn’t say in the law of the king but the deen (religion) of the king. Note: The law of Allah for stealing at Yusuf’s time seems to be the one stated in (Qur’an 12:75). This is evident because the brothers spoke without discussion and they all gave the answer which indicates they already knew the law of Allah (about stealing) from their father who was a Prophet. It seems that Yusuf tried his best to give Dawah to his people but it seems that the majority rejected him. He took on the task to save Egypt thus showing his Miracle of interpreting dreams but it seems that the King never accepted Islam. We use the following verses as proof. Only the people of Yunus believed in a large numbers. The other Messengers had only attained a small minority of its people to believe. Even us, the Ummah of Prophet Muhammad (SAW) are not at the level of the people of Yunus because as we know, 1 out 1000 only will go to Paradise and the rest (999) will go to Hell. Patience is the ability to still be thankful and grateful despite the hardships. Many people become corrupted with wealth and fame but these didn’t change Yusuf’s pious behavior. Yusuf’s character shines in all situations. Yusuf in his lowest part of his life in prison is called a Muhsinun by a person who didn’t even know him and the highest position in his life is still called a Muhsinun by his brothers who didn’t recognize him as Yusuf; which shows that wealth and fame didn’t corrupt him. The same words were said to him at the lowest and highest point in his life to show that the circumstances didn’t change him. This also highlights that some people have the ability to sense the aura that someone is a good person or not even if they don’t know you. Anwar Anawlaki: There was one incident that was narrated by Umar Ibn Khattab’s son Abdullah. He said one day a handsome man walked in front of us, so my father looked at him. He looked at his face and said, “If my intuition is right this man was a fortune teller for his people.” this is what you call a Farasa/firasah. It is the art of reading the face and Umar Ibn Khattab had that ability. It’s a gift from Allaah. You look into the face of some body and you read their personality. And Umar Ibn Khattab was good at Farasa/firasah. So by just looking at face of this man he never met him before, he read his face and he said, ‘this man used to be fotune-teller of his people’ so they called the man.and he said I have never seen something like this before, he was amazed. Umar Ibn Khattab told him to tell him about himself. By the way this issue of Farasa/firasah was seen as an art. They say that ash-Shafi’e went to Yemen to learn Farasa/firasah. So its some kind of art to be taught and it appears in some kind of culture like for example Chinese culture, they have some sort of different version of Farasa/firasah reading the face. But Rasoolullah sallalahu alaihe wa salam says ‘beware from the Farasa/firasah of believer because he can see by the light of Allah.’ So it’s a gift that is given by Allah to certain people and Umar Ibn Khattab had it. So Umar Ibn Khattab called the man and the man said “Yes, I was the fortune teller of my people”. Abdullah Ibn Umar Ibn Khattab said, “Rarely the intuition of my father would go wrong.” It was always on target. So Umar Ibn Khattab told him, “Tell me the strangest thing that your jinn told you.” Because the fortune tellers deal with jinns. [They were dealing with jinn.] So he said, “My jinn came to me, he mentions this rhyming words. Speaking about the coming of a prophet.” Umar Ibn Khattab said, yes that’s true. One day the man was sacrificing for the idols next to Ka’aba and a very loud voice was heard. And this voice was saying something similar there is a prophet was coming and then Umar Ibn Khattab said immediately after that Muhammad sallalahu alaihe wa salam claimed to be a Prophet. From the hadith and event of Umar above we can see that it is not only the believers who have this insight. Umar had this insight even when he was a disbeliever and was not a Muslim. The insight of the Muslim is far superior as we will explain and show via the Quran and Sunnah. In modern times this kind of intuition is called the sixth sense or ESP (Extrasensory perception) which is defined reception of information not gained through the recognized physical senses but sensed with the mind. There is of course skepticism from Science; the scientific consensus does not view ESP perception as a real phenomenon. Skeptics claim that there is a lack of a viable theory of the mechanism behind ESP and that there are historical cases in which flaws have been discovered in the experimental design of parapsychological studies. Praise be to Allah; The meaning of this part of the hadeeth is that when the believing slave strives to draw closer to Allah by doing obligatory acts of worship, then naafil acts, Allah will bring him closer to Him, and will raise him from the level of eemaan (faith, belief) to the level of ihsaan, so he will start to worship Allah as if he can see Him, and his heart will be filled with knowledge of his Lord, love and awe for Him, fear of Him, and glorification and veneration of Him. When his heart is filled in this manner, any attachment to anything other than Allah will disappear, and the person will not longer be attached to any of his whims or desires, and he will have no wish for anything except that which his Lord and Master wants. At that point the person will not speak except to remember Allah, he will not move except to obey His command. So when he speaks, he speaks for the sake of Allah; when he hears he hears for the sake of Allah; when he looks, he looks for the sake of Allah; i.e., he acts with the help and guidance of Allah and for the sake of Allah in these matters. So he only listens to that which Allah loves; he only looks at that with which Allah is pleased; he only strikes with his hands and walks with his feet for purposes with which his Lord and Master is pleased. It does not mean that Allah is his hearing and his sight, and Allah is his hand and his foot. Exalted be Allah above that, for Allah is above the Throne and He is Exalted above all His creation. Rather what is meant is that He guides him with regard to his hearing, seeing, walking and striking. Hence it was narrated in another version that Allah says: “In Me he hears, in Me he sees, in Me he strikes and in Me he walks,” meaning that Allah guides him in his actions, words, hearing and seeing. This is what it means according to Ahl al-Sunnah wa’l-Jamaa’ah. At the same time Allah answers his prayers, so if he asks Him, He will give; if he seeks His help, He will help him; if he seeks refuge with Him, He will grant him refuge. Adapted from Jaami’ al-‘Uloom wa’l-Hukam, 2/347; Fataawa Noor ‘ala’l-Darb, tape 10, by Shaykh Ibn Baaz, may Allah have mercy on him. Whoever suggests a meaning other than this is wrong and is transgressing the limits and showing disrespect towards Allah, and he is going against the Arabs’ own understanding of their language and what they understand by such words. Shaykh Ibn ‘Uthaymeen said in Majmoo’ al-Fataawa, 1/145 9: You see that Allah has mentioned one who worships and One Who is worshipped, one who draws close and the One to Whom he draws close, one who loves and the One Who is loved, one who asks and One Who is asked, One Who gives and one to whom it is given, one who seeks refuge and One Whose refuge is sought. The hadeeth refers to two who are distinct from one another, one of whom is not the other. If that is the case, than the apparent meaning of the words “I am his hearing, his sight, his hand and his foot” cannot be that the Creator is a part or an attribute of the created being. Exalted be Allah far above that. Rather the apparent and true meaning is that Allah guides this slave with regard to his hearing, sight and striking, so he hears purely for the sake of Allah, by the help of Allah, following the commands of Allah. The same applies to his seeing, his striking and his walking. You might be wondering how Allah has full power and authority over his affairs, right? Where was Allah, when Yusuf was thrown in a well, when he was sold as a slave and later on when he was thrown in jail and the prisoner who got out forgot about him and so on? Latif in Arabic is not just nice but also means subtle (not to grab any attention). This word is used in (Qur’an 12:100) when Yusuf is reunited with his family and he now sees the whole picture of his life. Even in Surah Kahf when the companions of the cave instructed their brother to be subtle (not to grab attention) when they sent him out; the same word latif was used. The way Allah does things is not meant to grab your attention. His plan is always at work in the background and you don’t even realize. So now his dominance is now coupled with his secrecy of how he does his plans. You might say how can this be? The other two names of Allah, the All-Knowing and All-Wise occur three times in three strategic positions in Surah Yusuf to teach us much. Even if you are powerful doesn’t mean that you have wisdom and even if you are Subtle doesn’t mean you know everything. The two pair of names balances those other names. Allah knew how the reunion was going to happen in the end and he knew that all of these were important phrases for him to go through. Allah knew that this was going to be profound inspiration for the final Messenger (SAW) one day who himself is going to be exiled by his brothers because that is when the Surah is revealed. In (Qur’an 12:5-6) Ya’qub is full of hope for Yusuf and he finishes by saying that Allah is All-Knowing, All-Wise which shows his optimism. So many bad things have happened in (Qur’an 12:83) such as the loss of Yusuf, the drought, the loss of Benjamin. The first time he said that Allah is the All-Knowing, All-Wise was when he was optimistic of the future and now with all the bad things in the worst situation he still trusts Allah and says that He (Allah) is the All-Knowing, the All-Wise. This means that he doesn’t see and know how he does things but I know he has a plan because he is the All-Wise and there is a lot he doesn’t know that Allah only knows. So he was going to just be quiet and trust Allah. The second time, Allah is the All-Knowing, All-Wise is used in Surah Yusuf is teaching us trust in Allah in bad times [that are beyond our control]. The first time was to teach us to be optimistic. If Yusuf was not in prison and he didn’t meet those two prisons a drought would have happened regardless but there would never have been someone to give the suggestions that Yusuf gave. Many people would have starved to death if Yusuf didn’t go through what he went through. This also included the survival of his own family too; his brothers and father would have starved to death too. There was a greater good that needed to be accomplished. And by the way he was able to sponsor all his family to move to Egypt and hence the children of Israel now live in Egypt and the saga of the Egyptians and Israelites begins which will inevitably lead to the coming of Musa. All of this begins with the trials of Yusuf. If that didn’t happen, none of this would have happened. Reflect on lesson: Did anything you ever viewed as bad in the past later made you realize it was actually good for you? Do you see the effects of Jealousy? They knew that their father was a Prophet but they still said that he was in plain error. They made a plan to kill their brother. The small issue of the love of their father to Yusuf became very big in their eyes and the big issue of killing a human soul became very small and insignificant. It is all because of jealousy. Their father loved them all since they were all his children but just because he loved Yusuf a bit more, they saw that as a great thing and big deal. So in order to feel good about this plan of killing or casting him out to some other land; they planned to do repentance after doing the evil. People differ in wickedness. If the one who is the least wicked amongst the group speaks up it is most likely to call to good. If the group accepts that good advice it is normally good for them but if they follow the advice of the wicked and the least wicked goes along with it then they will all be punished. If the brothers of Yusuf killed Yusuf, they would have killed a Prophet (believer) and Allah would probably have let them die as sinners to enter Hell but since they accepted that advise, they were forgiven by Yusuf way later and by Allah and they even asked their father to ask forgiveness for them. The people of the Garden: This story is related in (Qur’an 68:17-32). They intended to prevent the poor people from taking any fruit but Allah punished them by annihilating their garden and realized that they had gone astray and were wrong. The best among them said: “Did I not tell you: why do you not say: Insha’ Allah (if Allah will).” The story ends with them repenting. We see here how there was one person who called to good. The chiefs of Fir’aun: In (Qur’an 40:28-45) we see how even in the secret meeting of Fir’aun there was a person who hid his faith and was calling to good. He called to good and stuck to the good that he was calling to despite everyone being against him and Allah saved him. It is important to note that when sticking to the truth, Allah can decide to save you or allow you to suffer harm and receive the benefits in the Hereafter as did the believers who were killed in Surah Buruj where Allah calls it a great victory. So now you had the two armies facing each other before battle. One of the kuffar of Quraish was riding a red camel. And the Messenger of Allah said, “Whatsoever good may be with them resides in the man mounted in the red camel. If they were to obey him, they would be well guided.” He was referring to Utba Birabiya. Why did the Messenger of Allah say that? The kuffar of Quraish sent Umair Ibn Wahib to scout the muslim army and try to estimate how large the force is. He came back and he said, “What I did see, O Quraish was camels bearing death. They are a people whose only aid and refuge is their swords. I swear I don’t foresee any of them being killed without killing one of you. And if they do kill of you alike number as their own what good would it be to live after that. Consider carefully.” So Umair went and saw that the Muslim army is not large but when he looked in their faces he saw death. So Hakim goes went to convince Abu-Jahl and finds him in a gathering and tells him this is the message I have for you from Utba. So Abu-Jahl tells him, “Utba didn’t find anyone else to send but you?” So Hakim said, “No, he could have sent someone else but I wouldn’t have been a messenger except for him.” And then Abu-Jahl said, “I swear, his lungs are filled with terror when he saw Muhammad and his men. By Allah, we will not return until Allah decides the issue between us and Muhammad. Utba is not sincere in what he says. He sees Muhammad and his men as fodder for camels awaiting slaughter and his own son is there among them. He is scaring you for his own sake.” [Notice he is swearing by Allah’s name just the people of Thamud did in (Quran 27:49)]. In short Abu-Jahl is saying we are going to slaughter the Muslims and we are going to win and Utba is afraid that his son who is a Muslim is going to be killed and that is why he is trying to ask us to withdraw. And then Abu-Jahl this Satan goes to the brother of Amor Ibn Hadhali and says, “Your protector, Utba wants to withdraw the army back, go and inspire the army to fight.” So the brother goes and exposes his head and then he screamed and marches in front of the army inspiring them to fight. So not only did Abu-Jahl sweep the entire army with anger but was able to drive Utba into a corner and make him stubborn to the extent that Utba was the first one to stand forth and to ask for a duel with the Muslims. This shows you how effective this devil Abu-Jahl was. Let us stop here and comment on this: The Messenger of Allah said, “Whatsoever good may be with them resides in the man mounted in the red camel. If they were to obey him, they would be well guided.” So among the camps of disbelievers there are voices of reason, there are men of wisdom, there are people who are moderate. However when it comes to it being a battle against Islam, when it is a religious war with the intention of fighting the truth (the religion of Allah); these voices of reason, moderation are swept aside and you have the voices of fanaticism and extremism that gain the upper hand. I am saying this because Muslims sometime think that well since among the enemies of Islam there are people who are anti-war, people who are supportive of Muslim causes, there are people who are moderate, we think that these voices are the overwhelming voices and we think that there is hope that their opinion will overcome the voices of extremism. Well that is the case sometimes when it is a battle between kufr and kufr but when it comes to fighting against the Prophets of Allah or the followers of the Prophets of Allah it is different. You have to understand that here you are dealing with a different game. Abu Sufyan who would later become a Muslim, didn’t he urge the army of Quraish to go back, wasn’t he representing a voice of reason? Didn’t Banu Dhahara in fact withdraw and refuse to join in this battle to fight with their brothers? Didn’t Utba try? Didn’t Hakim try? Reflecting on the Lesson: Have you ever been in an evil group and you being the good person faced any of the above situations when giving out the best advice? The king was impressed with Yusuf before speaking directly with him but when he spoke directly with him, he became even more impressed. Yusuf was honest and pious and the king saw that; and that is why he gave him a high rank and trusted him. One has to be careful though; some people are good actors, especially the hypocrites. They can act and use this kind of face to face meeting to fool you and give you a false impression of themselves. Do you see the kind of play the brothers of Yusuf did to their father? In the end Ya’qub couldn’t do anything. Internally the brothers all knew that Yusuf was in a well and it was their fault and they planned this before even asking their father to let them go out with Yusuf. Internally Ya’qub sensed that they might do something bad to Yusuf but the brothers kept trying to make the father look bad by insisting that they were his well-wishers and blaming their father for not trusting them. This is similar to kids nowadays who want to go to clubs and blame their parents for not trusting them and that they are going there to give dawah while in fact they are going there to just party. Now the situation is in a merry go round. The father knows that the brothers are at fault and are responsible for what happened to Yusuf. They have to externally continue living as if the brothers are not responsible for this incident but all of them internally know that the brothers were responsible. We don’t know why the first known documented use of “Emotional blackmail” is recorded to appear in 1947 (Gregorian calendar) but this was in the Quran since over 1,400 years ago and these tactics were used in the past. The first known documented use of “emotional blackmail” appeared in 1947 in the Journal of the National Association of Deans of Women. “Emotional Blackmail Climate” was used to describe one type of problematic classroom control model often used by teachers. Emotional blackmailers use fear, obligation and guilt in their relationships, ensuring that others feel afraid to cross them, obligated to give them their way and swamped by guilt if they resist. Knowing that someone close to them wants love, approval or confirmation of identity and self-esteem, blackmailers may threaten to withhold them or take them away altogether, making the person feel they must earn them by agreement. Fear, obligation or guilt is commonly referred to as “FOG”. FOG is a contrived acronym—a play on the word fog which describes something that obscures and confuses a situation or someone’s thought processes. The person who is acting in a controlling way often wants something from the other person that is legitimate to want. They may want to feel loved, safe, valuable, appreciated, supported, needed, etc. This is not the problem. The problem is often more a matter of how they are going about getting what they want, or that they are insensitive to others needs in doing so that is troubling – and how others react to all of this. Under pressure, one may become a sort of hostage, forced to act under pressure of the threat of responsibility for the other’s breakdown. and could fall into a pattern of letting the blackmailer control his/her decisions and behavior, lost in what Doris Lessing described as “a sort of psychological fog”. After going through the emotional blackmail, Ya’qub in the future didn’t want to let them leave with Benjamin unless they swore a solemn oath to him in Allah’s Name that they would not do to Benjamin what they did to Yusuf. When a situation arises when you can’t trust someone but things have to be done by them, then you can make them swear to Allah to ensure things are moving on. For example you are in a neighborhood where you have heard and witnessed many times that the beggars there are frauds. If one comes to you and you want to help him but are not sure if he is genuine or not; then you can make him swear in Allah’s name that he really is in need and that he really needs the money not to use for foolish things. Yusuf tried his best to spread Islam (submission to Allah) to the best of his abilities. We can see the example of when he was in prison from (Qur’an 12:37-41) how well he did this. When he knew that the prisoners needed him badly, he first starts by informing them that Allah will allow the food to come to them only after he has given the interpretation of the dreams. He also spreads Islam by informing them that his skill of interpreting dreams was granted to him by Allah. The prisoners have no choice but to listen since the skills he has are from Allah and Yusuf is saying he only follows Allah Alone along with his fathers. He also adds that it is a grace to the whole of mankind but most men thank not. One ultimate form of giving Dawah is asking questions. In (Qur’an 12:39) Yusuf does not directly tell them to believe in Allah Alone but instead presents it as a subject for objective discussion. Human nature knows that there is only one deity. Yusuf now after explaining Allah and posing a question, starts exposing the weakness of having multiple gods and what Allah requires from us. After all this he proceeds to give them the interpretation of the dreams. Lesson: Give Dawah as much as every opportunity presents itself. If someone praises you for a skill you have, don’t forget to tell them that it is thanks to Allah and so on. You can’t just regard people as insignificant; we all know that Yusuf was so significant and he helped so many people. We know of this now many years later but at that time they were with him they regarded him as insignificant. Since this was Allah’s plan, we can’t really blame the people of the caravan right? Wrong, it was because they themselves were regarding people as insignificant and hence were chosen to pick Yusuf up to take him to the castle in Egypt. If they didn’t regard Yusuf as insignificant then they wouldn’t have been chosen to take Yusuf out of the well, other judgmental people would have been chosen by Allah. Allah does what He wills and He can use even the Satans to accomplish what He wants accomplished. Always try to give advice in the best possible way. Do you see how the witness gave her advice even though the witness knew who was at fault? The first possibility is stated first so that it would appear that she was right and because Yusuf was just a slave. The second possibility is mentioned last even though it is the truth because the witness didn’t want it to seem that he was favoring Yusuf over the Minister’s wife. When we are able to deliver our thoughts to others with beautiful manners, why then resort to horrible ones? There was once a king who saw in a dream that all his teeth had fallen out. He called a dream-interpreter, told him what he saw in the dream, and asked him to interpret it. The king screamed, became furious, and began to hurl abuses and insults. He then ordered that the interpreter be imprisoned and called another interpreter, related to him what he saw in the dream and asked him for its interpretation. The king became very pleased, showered him with gifts and remained content with him whilst angry with the first dream interpreter. If you contemplate, you will realize that both of the interpretations were the same, the difference was in the way in which the interpretation was conveyed. Hence, the tongue is the master. In those times having many male children was something to be envied for as stated by the brothers in (Qur’an 12:8). Ya’qub was trying to protect his sons from the evil eye. The brothers followed the advice of their father. Allah informs us that even though they followed their father advice, Allah would still carry on His Will despite their planning. Ya’qub was also aware of this yet he still advised his children to do this to ensure that he did his best and trusts whatever Allah brings about. 1 – Yusuf (alayhis-Salam) has a dream. 1 – Yusuf (as)’s dream is interpreted and realized. 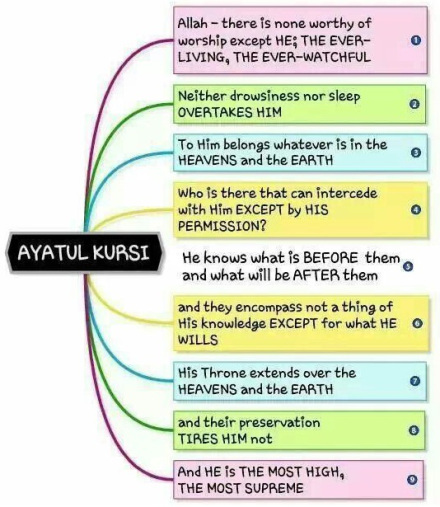 This is spread out in exactly this order over 100 ayaat. Problems are introduced and solved in reverse symmetric order. Remember, these are verses of speech. Qur’an wasn’t revealed as a book. The events show that the King’s dream being interpreted was the most important to help save many people. We (IARLG) got the inspiration to look for more Surahs with this nature from Nouman Ali Khan and Allah helped us find two surahs which are Surah Saff and Surah Qalam. [Ayat 1 to 4] and compare with [Ayat 10 to 14] è Allah in the beginning lets us know everything glorifies Him and is asking us believers why we don’t do what we say and how that is hateful to Him. He also tells us what He (Allah) loves us believers to do. In the end of the Surah, Allah addresses us believers again and lets us know how to please Him and gives us an example of people who did well. 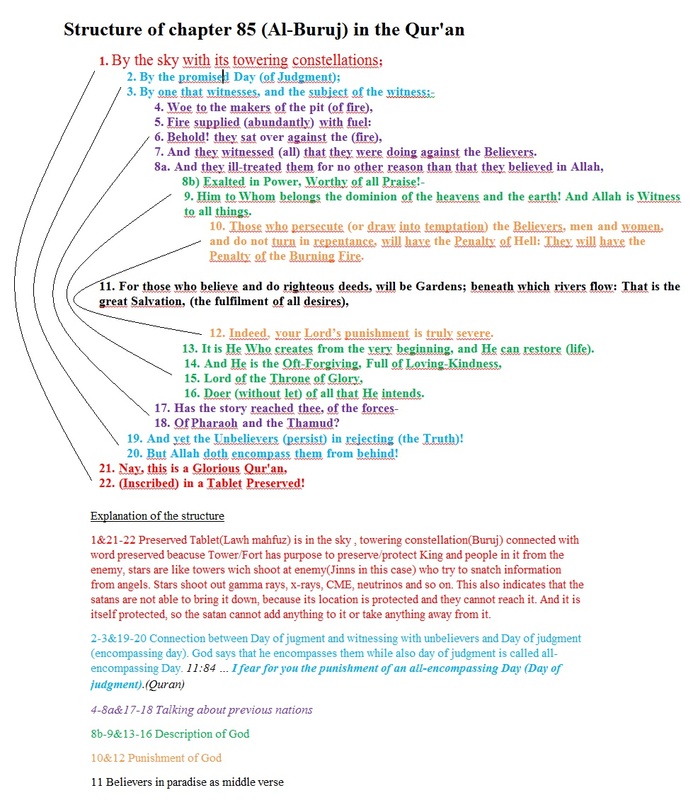 [Ayat 5 to 6] and compare with [Ayat 9] è The Ayat 5-6 shows how the children of Israel didn’t take advantage of their Prophets and did what angered Allah as shown in Ayat 1-4. In Ayat 9 we are shown that Prophet Muhammad (SAW) was sent to make Islam victorious over all religions. [Ayat 7] and compare with [Ayat 8] è These two Ayats presents the central message about this Surah. In Ayat 7 the disbelievers are exposed to invent lies against Allah. In Ayat 8, Allah says that these lies aim to put out the Light of Allah with their mouths but Allah will put out their Light even if they hate it. It is as if Allah has encircled the disbelievers because Ayat 1 declares that Allah is the All-Mighty and All-Wise and in Ayat 8, he has sandwiched those liars. [Ayat 1 to 7] and compare with [Ayat 47 to 52] è Prophet Muhammad (SAW) is assured that he is not a madman in Ayat 2-7 since the disbelievers call him a madman in Ayat 51. It is through the Grace of Allah that he is not a madman as it was also the Grace of Allah that saved Yunus. Allah in Ayat 7 informs the Prophet (SAW) to continue giving Dawah because only He knows who is best guided and who is not. The Ayats 47 to 52 informs him not to be like the companion of the fish even if they deny him. Now that the Prophet (SAW) has been ordered not to abandon his task of conveying. [Ayat 8 to 9] and compare with [Ayat 44 to 46] è He is further told not to obey the deniers in Ayat 8 and Ayat 44 tells him to leave the deniers of the Quran to Allah Alone since he will punish them from directions they perceive not. Ayat 9 tells us they want to compromise even though the religion has no price and is free to enter that even Allah says in Ayat 46, “Or is it that you ask them a wage, so that they are heavily burdened with debt? [Ayat 10 to 15] and compare with [Ayat 35 to 43] è Ayat 10-15 is where the characteristics of these deniers is mention and ends in Ayat 15 where Allah says that He will brand him over the nose. They have been warned. In Ayat 35-39, Allah is addressing the disbelievers before turning to Muhammad (SAW) in Ayat 40-41. In Ayat 42-43, the disbelievers and hypocrites will not be able prostrate and hence this is probably where the threat of Ayat 16 will take place. [Ayat 17 to 32] and compare with [Ayat 34] è Here we are told about the owners of the garden from Ayat 17-32 and how they wronged themselves and sought repentance from Allah in this world. Ayat 34 indicates that they were forgiven since it says the pious will have Gardens of delight with their Lord. Since they repented, they are most likely the pious now. And Allah knows best. [Ayat 33] è This is the central message which informs us on what is going to happen in the Hereafter from Ayat 34-52. In Ayat 34-52 is also Allah addressing what was stated in Ayat 1-32. Ayat 1-32 were all taking place in this world. 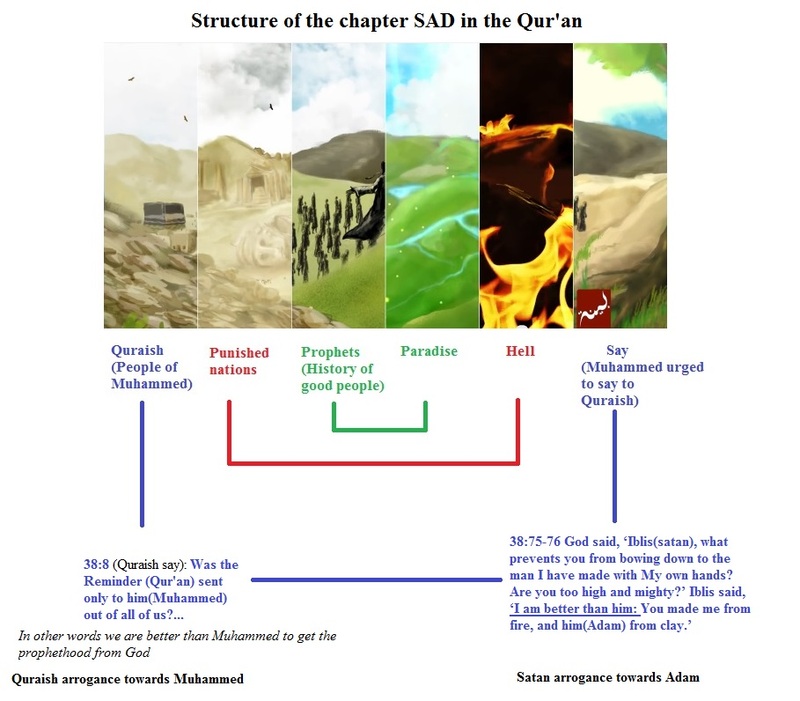 There are many other Surahs to explore; we just heard from Nouman Ali Khan that Surah Qasass also has this ring structure from comparing Musa’s story in the beginning who was wealthy but not showing off and Qarun at the end who was not that wealthy but was not showing off to many others such as comparing the Quraish who wanted Prophet Muhammad (SAW) to perform the miracles of Musa and the Children of Israel who believed in the Quran. The Quran is interesting right? Though we tried indicating so and so got the idea it may not be true. We have just written the person we learned the lesson from. Allah will In Shaa Allah reward those whom we got the ideas from and from those they got the ideas from if they got them from someone else not Allah. We have surely not covered all the lessons present in Surah Yusuf; what we did is present a demonstration of what can be found in it. Some benefits were discovered in the past, others are being discovered now and others will be discovered in the future. The Quran didn’t change but Allah grants everyone some knowledge to derive certain benefits from Surah Yusuf but only Allah knows all the benefits present fully. This encourages us to seek knowledge from different scholars to be able to gain what Allah gave them of knowledge. Even a Prophets didn’t’ gain all the knowledge directly from Allah. They sometimes had to go through other people to learn. This is by the Wisdom of Allah. Prophet Musa had to learn from one of Allah’s slaves as can be found in Surah Kahf. Prophet Muhammad (SAW) in (Qur’an 3:159) is taught to seek counsel with his companions. In the battle of the trench, the digging of the trench idea was provided by Salman Al Farasi. Some of the companions of Prophet Muhammad (SAW) had the same dream about the Adhan (the call of prayer). At that time they were discussing what they should use for the call to prayer. These dreams of the Adhan were approved by Prophet Muhammad (SAW). This means that knowledge of the Adhan came to the companions first and not directly to Prophet Muhammad (SAW). Hello to every body, it’s my first visit of this weblog; this weblog includes remarkable and actually excellent material designed for visitors.